I thought it was about time that I updated on the new walking boots I got at Christmas, my Scarpa Terra GTX. So, where did we leave it? I'd gotten them out of the box and briefly reviewed their features. And I'd taken them for their first walk. They'd seemed comfortable enough though I wasn't sure about the high ankle cuff but I needed to wear them on a few more hiking trips before making a judgement. Now we are two months on and I've been away for a few camping weekends with my new boots. They've been up hill and down dale on a trip to Lord's Seat, Edale. They've helped me navigate the rocky ascent up Kinder Scout via Crowden Clough and test out the frozen moorland on top. They've been covered right to the top of the ankle cuff in mud. And they've been through the overflowing River Dove at Biggin Dale. I can honestly say I love my boots. The first time I took them away, in my hurry, I'd left the plastic tag on, just ripping off the card around it. And to this day, I haven't taken it off. It's now almost like the plastic tag makes my boots mine! I look out for puddles that I can step in, knowing that my feet will now stay dry. I've never had a blister off them and now I don't even realise that I'm wearing them, they fit my feet so well, and whatever terrain I'm walking they seem comfortable and confident. Each time I get them home, I make sure they get cleaned up before the next trip. They looked at bit more worn after my last adventure messing around on a scree slope but get them home, wash them off and dubbin them and they look almost like they've just come out of the box. Long may it continue. And I've just read on the LiveForTheOutdoors forum about an example of fantastic customer service from Scarpa so I'm really feeling very pleased with my choice of walking boot. And I can't wait to put them on again and head out for a weekend hiking. Lovely review, just bought a pair myself, but have not walked outside the house yet. We shall see how they perform soon! I am getting a pair for christmas this year and this has made me very excited! 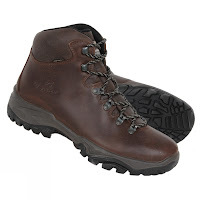 Have some similar scarpa boots but the sole is too stiff for some walks. I think these one's look really good too. I like your blog, you seem to walk in areas that I do also! love those boots perfect for mountain climbing.. well I do hope I can finish my Tera Leveling Guide this weekend before our mountain climbing start at Mt. Apo - Albay, Philippines.